Station staff, fellow passengers revive woman who collapsed at Tel Aviv HaShalom railway station due to a heart attack. 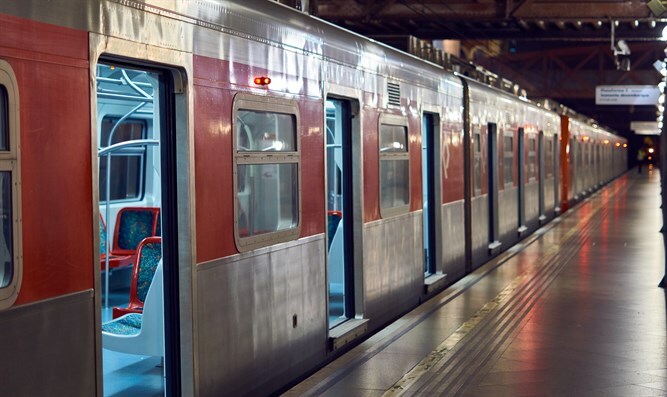 A woman suffered t heart attack at the Tel Aviv HaShalom railway station Wednesday evening. Her life was saved thanks to the quick intervention and resourcefulness of the staff and nearby passengers. The 30-year-old passenger, who was waiting at the station platform, collapsed suddenly from a heart attack. Her fall was seen by the steward on the platform and the shift manager, who immediately began resuscitation efforts. While the station staff used a defibrillator to jumpstart the man's heart, several other passengers, including a doctor and a paramedic, came and began to administer CPR. Due to the rapid treatment and availability of the defibrillator, the patient's heartbeat was restored, and the woman quickly recovered consciousness and was evacuated to the hospital via an intensive care unit. Israel Railways installed the defibrillators in each of the 68 passenger stations, in all the operational areas of the train, along with medical kits, and this is not the first time that the life of a passenger or employee has been saved thanks to their ready availability. Shachar Hillel, the station's director, said, "I am happy that we and the station staff helped to save the life of the passenger, along with our passengers, who included medical professionals. Today we received additional proof of the great importance of quick response in the event of a medical event. Employees of the passenger division of Israel Railways, including station managers, shift workers and inspectors, are regularly authorized to provide first aid and resuscitation, and this proves it. I and the station staff wish her a speedy medical journey on our behalf and on behalf of Israel Railways."